Tom Hanks has admitted that he loved the music of the Mersey Beat scene and, probably inspired by his memories, he made his debut as a writer and director with this affectionate tale of a sixties pop band called the Wonders (incidentally, in this film he actually looks a bit like Brian Epstein). 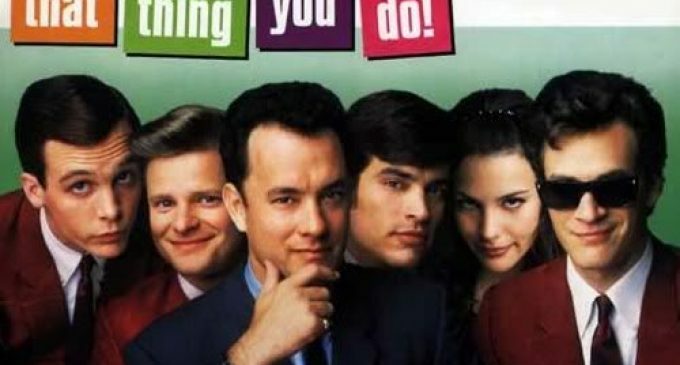 He’d written the script after finishing ‘Forrest Gump’ and showed it to director Jonathan Demme who took it to 20th Century Fox and it was released in America in October 1999. Hanks also helped to co-write some of the songs. 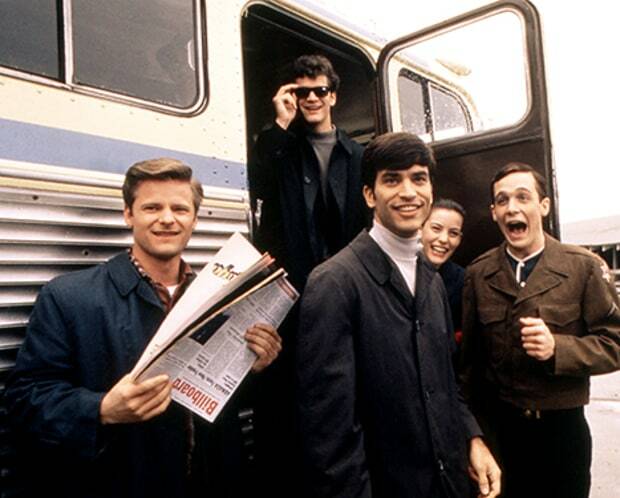 The cast includes Tom Everett-Scott in his film debut as Guy Patterson, Johnathon Schaech as Jimmy, the lead singer, Steve Zahn as Lenny, on guitar, Liv Tyler as Faye Dolan, Jimmy’s girlfriend, Tom Hanks as Mr. White, Ethan Embry as the Bass Player, Charlize Theron as Tina, Obba Babatunde as Lamarr, Giovanni Ribisi as Chad, Chris Ellis as Phil, Alex Rocco as Sol, Bill Cobbs as Del Paxton, Peter Scolari as Tony, Rita Wilson asMarguerite, Chris Isaak as Uncle Bob and Kevin Pollak as Boss Koss. The film is set in Erie Pennsylvania in 1964 and outlines the fortunes of a young American band shortly after the Beatles had taken America by storm. The four-piece band is called the Oneders and comprises singer/songwriter Jimmy Mattingly, drummer Guy Patterson, guitarist Lenny Haise and T. B. Player (the bass guitarist, who isn’t named). Guy is initially working at his father’s appliance store and practices on his drums in the store at night to the sound of albums by jazz musicians. He’s friendly with a local band and when their drummer Chad breaks his arm, singer Jimmy asks him to join them for their gig at a talent contest at a college dance (the drummer tries to jump over a parking meter, but catches his leg and breaks his arm). 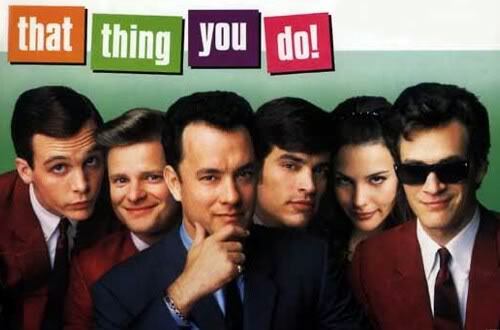 While they are appearing in a contest at Mercyhurst College, Guy speeds up the tempo on the band’s signature tune ‘That Thing You Do’, which initially irritates the other members, with one of them saying “What’s going on here? But the audience love it and the up-tempo version of the number secures the group $100 and a win in the contest. Guy’s Uncle Bob even organises a recording session for them. As a result of their increasing local popularity, they began to get more local gigs and come to the attention of talent agent Phil Horace, who fixes them with airplay locally and a gig in Pittsburgh, where they are noticed by Mr White of Playtone Records, who becomes their manager and changes their name to the Wonders. They begin to appear at state fairs with a stable of Playtone acts. Their record begins to receive promotion on radio and Faye runs through the streets to the appliance store where Guy turns on every radio in the shop to the station playing it. The rest of the band joins them to dance with joy in the store. As they begin to enjoy success, Guy’s girlfriend Tina becomes involved romantically with her dentist, while Guy falls for Jimmy’s girlfriend Faye Dolan, who acts as the group’s costume mistress. The group progress from local gigs to TV specials and national tours and their single rises in the Billboard charts and reaches No.7. They appear in a film ‘Cap’n Geech and the Shrimp Shack Shooters’ and White discusses the recording of an album with them, but Jimmy doesn’t like the terms and decides to quit, having also split from Faye. The bass player leaves to join the Marines and while the group is in Las Vegas, Lenny gets married on the spur of the moment to a former Playtone secretary! The loss of two members and the various tensions within the band means that their short life as a chart group is at an end and they have become, literally, one-hit-wonders. Faye and Guy fall in love, get married, have four children and move to Washington where they found a music conservatory with Guy teaching jazz composition. Jimmy rejoins Playtone, leads another band called the Heardsmen and records three Gold albums. The bass Player is wounded in Vietnam, receives his purple heart and becomes a building contractor in Florida. The soundtrack was released by Epic Records, reached No. 21 in the Billboard chart and the tracks were: ‘Lovin’ You Lots and Lots’, the Norm Wooster Singers; ‘That Thing You Do’, the Wonders; ‘Little Wild One’, the Wonders; ‘Dance With Me Tonight’, the Wonders; ‘All My Only Dreams’, the Wonders; ‘I Need You (That Thing You Do); ‘She Knows It’, The Heardsmen; ‘Mr Downtown’, Freddy Fredrickson; ‘Hold My Hand, Hold My Hand’; ‘Voyage Around The Moon’, the Saturn; ‘My World is Over’, Diane Dane; ‘Drive Faster’, the Vicksburgs; ‘Shrimp Shack’, Cap’n Geech & the Shrimp Shack Shooters; ‘Time To Blow’, Del Paxton; ‘That Thing You Do’, live at the Hollywood Television Showcase, the Wonders. 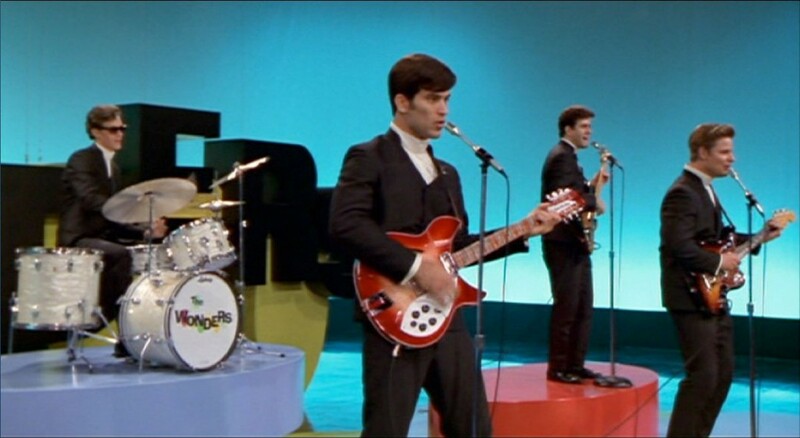 None of the actors who comprised the band members had been a professional musician and all had to be trained to play their instruments – which they actually play themselves in the film. The actors also went on a concert tour in Japan as the Wonders to promote the film. Hanks’s wife Rita Wilson appears in a scene as the barmaid who introduces Guy to his jazz drummer hero Del Paxton.